Arneja Heart Institute is a renowned Cardiac Care unit in central India. It is looked upon as the final word in cardiac care, be it preventive cardiology, cardiac diagnostics, emergency and routine cardiac treatment,Interventional cardiology or cardiac surgery. The hospital carries out over 2500 Coronary Angiographies and 1000 Coronary Angioplasties with stent implantation every year, and has to its credit a success ratio of over 95%, commensurate with best world standards. Internationally this institute has developed a reputation of its own, where patients from UK, USA Australia & West Asia have been successfully treated. 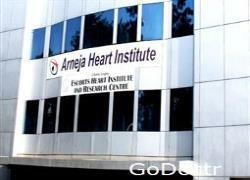 Arneja Heart Institute is one of the avant-garde heart hospitals of the country. The Institute was founded in Oct 2002, with the sole purpose of providing top of the line heart care facility. Arneja Heart Institute is a massive, state of the art facility spread over 25,000 square feet designed by Archemedes India Ltd., the renowned hospital design consultants from New Delhi. The hospital has been designed to offer the finest in cardiac care to all sections of the society with innovative packages ranging from well appropriated general wards to luxurious VIP suites. The hospital has been upgrading its infrastructure and treatment facilities since 2002. At Arneja Heart Institute, we developed our trans-radial program in the year 2005. Since then we have performed over 9000 trans-radial procedures. Over 95% of all angiographies and 70% of angioplasties done at our Cath Lab are through the radial route. Our series on trans-radial interventions is one of the largest series in this part of the country. A highly sophisticated IT infrastructure at the institute is linked to a two way Audio-Video conferencing facility which enables a) Online Teaching, b) Live demonstration of coronary Angiographies, Angioplasties and Bypass Heart Surgeries. Apart from Cardiologists and Cardiac Surgeons, the hospital service is backed by full time Anesthetists, Intensivists, Internists, Resident Doctors, Trained Nurses and Technicians. The hospital ICCU facilities are large enough to accommodate 21 well equipped intensive care beds, and 40 recovery beds for patient care. The rooms range from general wards to twin sharing rooms, single rooms and deluxe rooms. The Arneja Heart Institute facility operates a 24 hour Pathology, Pharmacy and Radiology Department to assist patients at any given time, along with a air conditioned Library and Conference hall to seat 100 delegates. “To operate as a world – class heart hospital, through the efficient deployment of technology and human expertise, in a caring and nurturing environment with the greatest respect for human dignity and life”. Conduct everything we do with highest standards of professional, moral and ethical integrity. Pursue excellence and continuous improvement in technology, skills, services and quality of interaction. Be responsive to the physical and emotional needs of patients and their families, and expectations of the society. Show respect, compassion and truthfulness towards patients, co-workers and all persons we serve. Recognize that working together can create a power greater than the sum of individual activities and that team work demands mutual respect, collegiality, consensus seeking and cooperation. M D India Health Care Ltd. Safe Way Health Care Ltd.
T T K Health Care Services. Bajaj Allianze Health Care Services. Patients are requested to inform the Indoor Billing Department within 24 hours of admission regarding the use of cashless services. Incase patient is admitted at night they can inform the indoor Billing Department by 10:00 a .m. the following morning. Xerox copy of cashless card, policy copy should be produced and submitted in Indoor Billing Department within 24 hours of admission. Patients as well as relatives are requested to give correct patient details e.g. Name, age, address, photo ID, phone number, proper medical history previous operation at the time of admission. Third Party Assurance Company can take anytime between 24 hours to 72 hours (1 day to 3 day) to give any reply i.e. acceptance or denial. OPD services and investigations like Health Check-up plans. Echo, Treadmill test, Dobutamine Stress Echo cannot be include in Cashless services by the TPA. If, denial is received from the respective insurance company, the patient will be treated as a general patient in regards to the charges and payments. If, the patient requests for a higher room category than entitled for, the patient will have to pay the room / package difference. Disposables and consumables are non cash items and hence the patient will have to pay for those.